We haven't been able to hit the beach much lately due to work, but when we do the bite has been pretty good. Matthew and I hit the beach a few weeks ago before I went out of town to try and get a few fish on the sand. As usual we load up the kayak and our rods grab some bait and head out. We went out to one of our favorite spots and put out some solid cownose rays on my 14/0 and Matts duel 12/0w. Whenever we are looking for monsters we do some pretty far drops between 600 and 700 yards. My 14/0 bait got picked up a with a solid run and then dropped, but I knew he would come back for it, so I stayed patient and sure enough he came back. This time the run was much faster! I let him eat for a good amount and then I stuck him! FISH ON! The fight was pretty good as I was fighting Matt calls out "it's a lemon" and sure enough a solid lemon shark! After releasing the lemon we put out another bait and waited hoping to get another one. The rest of the night was pretty quiet besides a few runs on matts duel which the Sharks dropped and didn't come back like the first. Hope everyone is landing some monsters and hope to get out there and get some more soon! Tight lines and never pay retail again!! 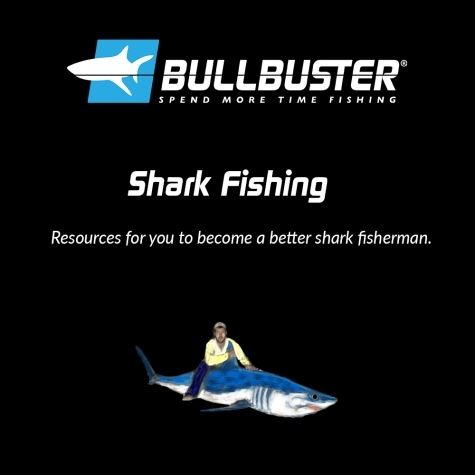 Shark Fishing (A Look Back In The Logs) - This article written by Bullbusters founder talks aboutthe history of landbased shark fishing, specifically the South Florida Shark Club, and how the right to sharkfish is often tested and must be protected. It also is why as a member of the sport you must remember that you are an ambassador for all shark fishermen, and when you do something at your beach it affects many other anglers in the sport.